نعیمی, نسیم, زارع, کبری, صالحی, اشرف. (1396). نگرش به ترس از زایمان طبیعی و ارتباط آن با سطح آگاهی در زنان باردار مراجعه‌کننده به بیمارستان تأمین اجتماعی شهر زاهدان در سال 1393. سلامت جامعه, 9(1), 10-18. نسیم نعیمی; کبری زارع; اشرف صالحی. "نگرش به ترس از زایمان طبیعی و ارتباط آن با سطح آگاهی در زنان باردار مراجعه‌کننده به بیمارستان تأمین اجتماعی شهر زاهدان در سال 1393". سلامت جامعه, 9, 1, 1396, 10-18. نعیمی, نسیم, زارع, کبری, صالحی, اشرف. (1396). 'نگرش به ترس از زایمان طبیعی و ارتباط آن با سطح آگاهی در زنان باردار مراجعه‌کننده به بیمارستان تأمین اجتماعی شهر زاهدان در سال 1393', سلامت جامعه, 9(1), pp. 10-18. نعیمی, نسیم, زارع, کبری, صالحی, اشرف. نگرش به ترس از زایمان طبیعی و ارتباط آن با سطح آگاهی در زنان باردار مراجعه‌کننده به بیمارستان تأمین اجتماعی شهر زاهدان در سال 1393. سلامت جامعه, 1396; 9(1): 10-18. مقدمه: دلایل مختلفی برای انتخاب عمل سزارین وجود دارد که شایع­ترین آن ترس از انجام زایمان طبیعی است. در این تحقیق نگرش به ترس و ارتباط آن با سطح آگاهی در271 نفر از زنان باردار مراجعه­کننده به بیمارستان تأمین اجتماعی شهر زاهدان در سال 1393بررسی شده است. پرسشنامه­ای، محقق ساخته و ساختارمند شامل4 بخش ویژگی­های دموگرافیک، سوابق بارداری، سؤالات آگاهی­سنجی و نگرش نسبت به انواع ترس از زایمان طبیعی بود، را توسط پرسشگر تکمیل نمودند. 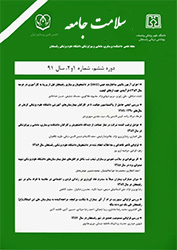 تحلیل آماری داده ها با استفاده از نرم افزار آماریSPSS نسخه 17 از طریق آزمون­های مجذور کای، اسپیرمن و آنوا انجام شد. یافته­ ها: آگاهی به سزارین، به ترتیب در 64 نفر (6/23%) خوب، 81 نفر (9/29%)، متوسط و 126 نفر (5/46%) ضعیف و دیدگاه زنان درباره ترس زایمان طبیعی به صورت سه نگرش منفی 19 نفر (7%)، خنثی 277 نفر (1/80%) و 35 نفر ( 9/12%) مثبت بود. بر اساس آزمون­های آماری رابطه معنی­دار و مستقیمی بین سطح آگاهی و نگرش به ترس وجود داشت (000/0 =p) ( 0193/=r). ترس از درد زایمان در بین 76 نفر (28%) بیشترین و ترس از برخورد نامناسب پرسنل در60 نفر (02/24%) کمترین اهمیت را داشت. بین شغل، میزان تحصیلات، سابقه بارداری و مشاوره قبل از بارداری با ترس ارتباط معنی­دار وجود داشت(05/0>p). نتیجه ­گیری: با توجه به ارتباط معنی­دار، سطح آگاهی درباره روش سزارین با نگرش نسبت به ترس از زایمان طبیعی، می­توان با آموزش­های صحیح زنان باردار، سطح آگاهی درباره روش­های ختم بارداری را افزایش داد. همچنین باید با ایجاد نگرش صحیح درباره زایمان طبیعی از طریق، زایمان بدون درد، یا روش­های دیگر در ارجحیت روش زایمان طبیعی و ترویج آن کوشید. 3Khomain Faculty of Nursing and Midwifery, Arak University of Medical Sciences, Arak, Iran. Introduction: There are several reasons for choosing caesarean section among them the fear of vaginal delivery. In this study, attitudes towards fear of vaginal delivery and its relation to the awareness level of pregnant women was investigated. Material and Methods: In this cross-sectional study, 271 pregnant women referring to the social Security Hospital of Zahedan were studied. During 4 months in 2014 the women completed a researcher-made questionnaire, consisting of 4 parts: demographic information, history of pregnancy, questions about subjects’ level of awareness, and attitudes about fear of vaginal delivery. The validity and reliability of the questionnaire was determined by test-retest. To analyze the obtained data, Chi-square, Spearman, and ANOVA was used through applying SPSS V: 17 software. Results: The level of awareness about cesarean section was in 64 cases (23/6%) good, 81 (29/9%) average and 126 (46/5%) poor. On the other hand, the women's perceptions about the fear of vaginal delivery in 19 patients (7%) Neutral, 277 (80/1%) and 35% (12/9%) were positive. According to statistical analysis there was a significant positive relationship between the level of awareness to Caesarean section and attitude towards fear (P=0/000)(r=0/193). Fear of labor pain in 76 (28%) was considered to be the most important reason and fear of the personnel’s inappropriate behavior in 60 women (24/02%) was the least important reason. Additionally, age, level of education, history of pregnancy, and consultation before pregnancy were significantly correlated with fear (p<0.05). Conclusion: Based on the significant relationship between the levels of awareness about Caesarean section and attitudes towards fear of vaginal delivery, with appropriate education the awareness level of pregnant women, about methods of pregnancy termination could be increased. Also, with implementing the right attitudes towards vaginal delivery through painless methods we could promote the vaginal delivery. Cunningham FG, Leveno KJ, Bloom SL, Hauth J, Gilstrap L, Wenstrom K. Williams Obstetrics .22nd ed. New York: MC Graw-Hill ; 2005:865-6. Hamilton BE, Martin JA, Sutton PD. Births: preliminary data for 2002. National vital statistics reports 2003;51(11):1-20. Johanson R, Newburn M, Macfarlane A. Has the medicalisation of childbirth gone too far? BMJ 2002;324(7342):892-5. Moore B. Appropriate technology for birth. The Lancet 1985;326(8458):787. Gamble JA, Creedy DK. Women's request for a cesarean section: a critique of the literature. Birth 2000; 27(4):256-63. Liu S, Liston RM, Joseph K, Heaman M, Sauve R, Kramer MS. Maternal mortality and severe morbidity associated with low-risk planned cesarean delivery versus planned vaginal delivery at term. Canadian medical association journal 2007;176(4):455-60. Zamani S, Farnia M, Torknejad A, Alaei BA, Gholizadeh M, Kasraee F, et al. Patterns of drug use and HIV-related risk behaviors among incarcerated people in a prison in Iran. Journal of Urban Health 2010;87(4):603-16. Aziz S, Memon A, Tily H, Rasheed K, Jehangir K, Quraishy M. Prevalence of HIV, hepatitis B and C amongst health workers of Civil Hospital Karachi. Journal of Pakistani Medical Association 2002;52(3):92-9. Kealy MA, Small RE, Liamputtong P. Recovery after caesarean birth: a qualitative study of women's accounts in Victoria, Australia. BMC pregnancy and childbirth 2010;10(1):47. Green JM, Baston HA. Feeling in control during labor: concepts, correlates, and consequences. Birth 2003;30(4):235-47. Bryanton J, Gagnon AJ, Johnston C, Hatem M. Predictors of women’s perceptions of the childbirth experience. Journal of Obstetric, Gynecologic, & Neonatal Nursing 2008;37(1):24-34. Obstetricians ACo, Gynecologists. ACOG Committee Opinion No. 394, December 2007. Cesarean delivery on maternal request. Obstetrics and gynecology 2007;110(6):1501. Fuglenes D, Aas E, Botten G, Øian P, Kristiansen IS. Why do some pregnant women prefer cesarean? The influence of parity, delivery experiences, and fear. American journal of obstetrics and gynecology 2011;205(1):45. e1-. e9. Alehagen S, Wijma K, Wijma B. Fear during labor. Acta obstetricia et gynecologica Scandinavica 2001;80(4):315-20. Ghasvari M, Rahmanian V, Rahmanian K. Knowledge of pregnant women in the southwest Iran about complications of cesarean section, 2009. Journal of Jahrom University of Medical Sciences 2012;10(2):31-5. Chu K-H, Tai C-J, Hsu C-S, Yeh M-C, Chien L-Y. Women's preference for cesarean delivery and differences between Taiwanese women undergoing different modes of delivery. BMC health services research 2010;10(1):138. Serçekuş P, Okumuş H. Fears associated with childbirth among nulliparous women in Turkey. Midwifery. 2009;25(2):155-62. Nerum H, Halvorsen L, Sørlie T, Øian P. Maternal Request for Cesarean Section due to Fear of Birth: Can It Be Changed Through Crisis‐Oriented Counseling? Birth 2006;33(3):221-8. Gungor S, Baser I, Ceyhan T, Karasahin E, Kilic S. ORIGINAL RESEARCH–COUPLES'SEXUAL DYSFUNCTIONS: Does Mode of Delivery Affect Sexual Functioning of the Man Partner? The journal of sexual medicine 2008;5(1):155-63. Ridley RT, Davis PA, Bright JH, Sinclair D. What influences a woman to choose vaginal birth after cesarean? Journal of Obstetric, Gynecologic, & Neonatal Nursing 2002;31(6):665-72. Lee LYK, Holroyd E, Ng CY. Exploring factors influencing Chinese women's decision to have elective caesarean surgery. Midwifery 2001;17(4):314-22. Moscucci O. Holistic obstetrics: the origins of “natural childbirth” in Britain. Postgraduate medical journal. 2003;79(929):168-73.